Attaching an Aimpoint, a Trijicon, or a EOTech to sight even half a dozen guns in going to be insanely expensive. So you think…I’ll go cheaper. But then you hit the internets and start hearing that cheap optics are all garbage. So you get the optics blues. You can’t sell any of your guns, that would be a travesty. You find out selling a kidney isn’t exactly legal, and you just don’t know what to do. Well you’re in luck. I’m going to tell what you can do, and how to outfit your rifles, shotguns, and pistols without breaking the bank. We are going to separate fact from fiction in terms of internet forums, and list a few affordable, but high quality optics. The internet wisdom of cheap optics are crap is somewhat true, cheap optics typically are crap. The problem is these intent commandos lump anything that isn’t Aimpoint, Trijicon, Steiner, Zeiss, or Leupold in the crap realm. That is where they are wrong. There is a big difference between cheap and affordable. Affordable doesn’t mean crap. Affordable is often a compromise that delivers an optic that works, and will last, without some of the features higher end optics may have. We picked out and tested some of the most popular affordable optics around. Here are the best of the best. I really like miniature red dots and I’m pretty pumped to see them become more popular in the last few years. They are perfect for almost any gun, be it a handgun, rifle, or shotgun. If you want small, and lightweight optic this is about as small as you are going to get. The Burris Fastfire series is awesome for a variety of reasons, one of them being its price. It’s an actual, hand-to-God quality red dot optic that’s priced a bit under 200 dollars. 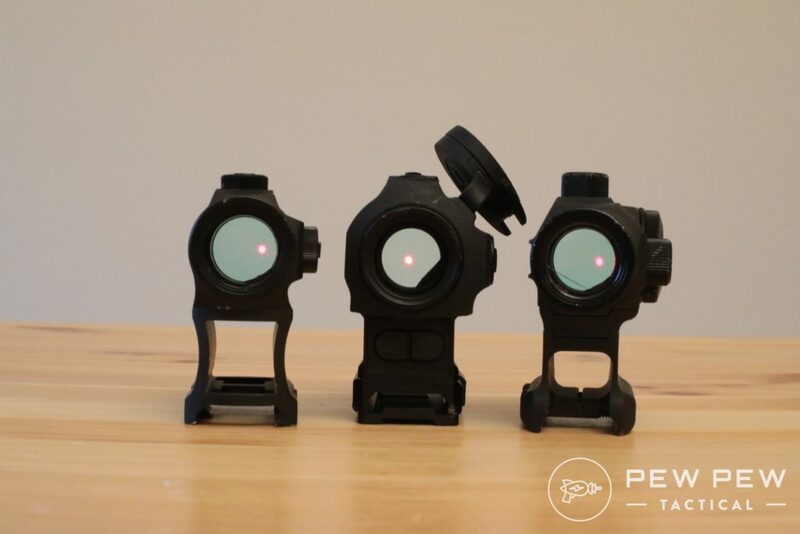 The Fastfire III is one of the originals in the miniature red dot optics, maybe not the first, but one of the pioneers. The Fastfire is perfect if you are interested in tossing a miniature red dot onto your handgun, but also not interested in spending North of 400 bucks. The Fastfire is well known, and quite common, enough so that its standard for pistol optics mounts. It’s popular enough that Glock’s no 1 mount works with the Fastfire red dots. 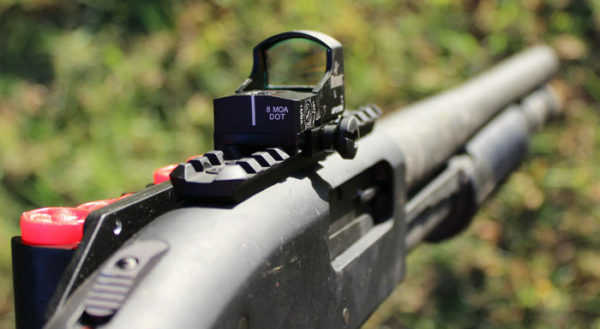 The Fastfire features a 4 MOA reticle. Typically with these red dots you want something that rides between too small and too big. A small dot is excellent for making precision shots, but miniature red dots aren’t really made for precision. A big dot is better suited for close quarters shooting, and with a handgun this can be desirable. However, one of the big advantages to a red dot mounted handgun is your ability to shoot at longer ranges a bit easier. 4 MOA is a good little compromise. 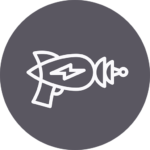 The Fastfire is also made entirely of metal, with minimal plastic components. 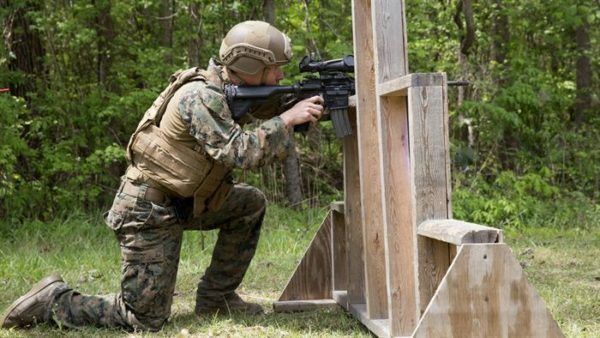 It’s designed for heavy use to withstand thousands of rounds, and can be used to rack the slide one handed against a gun belt or table. Even if it fails it has a lifetime warranty. Personally when purchasing affordable optics I always look at the warranty. This way if turns out to be not so great, I’ve still got a warranty to make sure my investment is protected. I’m typically a skeptical person when it comes to optics, and I tend to be shy of overseas brands. Lately I have been coming around, especially if I’m looking for an optic for a fun gun, or a competition gun. You dont need an Eotech on something that’s just for fun. I’ve got different standards for my home defense or go to war guns than I do for my fun and competition guns, but that’s a story for another article. If my life isn’t on the line I tend to be a bit more trusting. That’s what lead me to the Holosun HS403A ($125). Yes it is a made in China optic, but it’s certainly one the higher tiered made in China optics. And it was the winner of our Best Red Dots Under $200. It survived drops, heat, cold, and even rust issues. The optic is AR height and pretty lightweight and compact. It’s not a miniature optic, but it’s a step below full size. If minature red dots are Glock 26s this is a Glock 19. It’s a very simple, and robust red dot. Holosun also offers a lifetime warranty, which again is something I really want to see with optics on the affordable scale. It’s me feel a little more confident to hit that Buy Now button. It was a few years ago Bushnell jumped on the AR bandwagon and began releasing a series of scopes aimed solely at the tactical market. The Drop Zone 223 ($145.00) was one of those scopes. It was introduced as a budget 1 to 4 power optic with a 223 Bullet drop compensating reticle. The 1-4x scope market has exploded in the last few years though, and these days Bushnell offers an excellent entry level optic into this realm. 1 to 4 on an AR 15 is just about perfect for both close and long range shooting. They followed it up even more recently with the AK Optics ($197.54, which are nearly identical to the AR drop zone, but built for the AK of course. The magnification range is perfect for both the AK and AR style of rifle. At the 1 marker you can use a two eyes open method of shooting with the illuminated reticle for an impromptu red dot. When you need to reach out and touch a target all you need to do is spin the magnification dial and start engaging. I own the AK optics variant of this very scope and it’s brilliantly made. A bit longer than I think necessary, but it doesn’t affect function. It’s very simple to use, and surprisingly rugged. Photo Courtesy of LoadoutRoom.com and the author. The AR optic is tuned to work with 55 to 62 grain 223 loads. There is a minimal difference in the flight paths of these rounds and their drop is similar enough for the reticle to work for both weights. The AK optic is tuned for 123 grain rounds. This covers your most common AK ammo from Wolf, Tula, and more. The bullet drop compensator goes out to 500 yards and utilizes illuminated mil dots to mark where each round is destined to go. The system is simple, and reliable. Again, when using the AK version I’ve had zero issues ringing steel at 300 yards. The optics are simple, reliable, and most of all affordable. The AR variant is less than a 150 dollars, and the AK optic stays under 200 dollars. Bonus: Primary Arms FFP 4-14x Scope ($229.00) – A Budget Long Range optic? Am I slightly biased here? Just to clear the air and to be transparent I am a friend of the guys at Primary Arms. I got to meet them at Shot Show and we had a good time, and they were incredibly accommodating. With that said I’ve always been a fan of their FFP Tactical scope ($229.99). 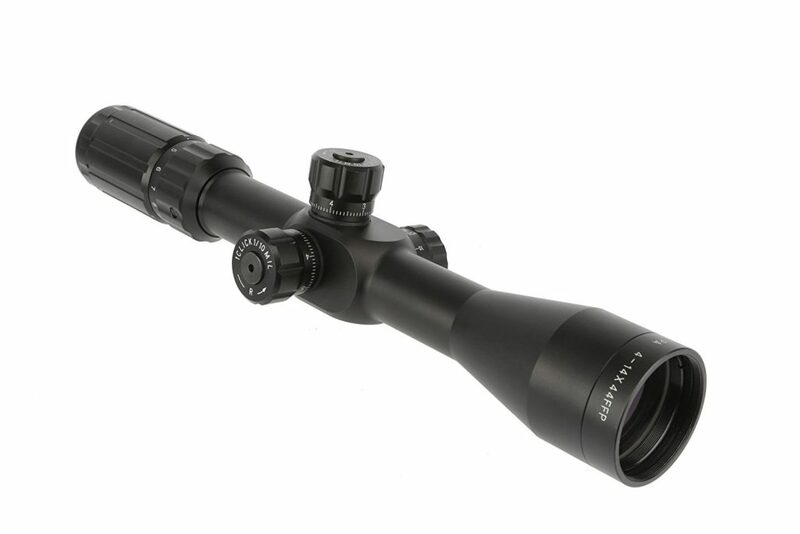 It’s certainly a powerful optic and it offers you a nice wide 4 to 14 power magnification range. It’s also in the first focal plane! First focal plane scopes are the better optic for long range shooting. With a First focal plane scope the measurements between mil dots (or any other markings) remain the same regardless of the scope’s magnification setting. This makes it a lot easier to gauge bullet drop when shooting long range. First focal plane scopes are also normally pretty expensive, they start around 500 bucks and only get more expensive. Primary Arms has managed to produce one for right around 250 dollars. The Primary Arms FFP is a solid choice for long range shooting on a budget. It seems to be best suited for 308 Winchester and below. The reticle is a mil dot variant that allows easy estimation of bullet drop and wind correction if you know what you’re doing. 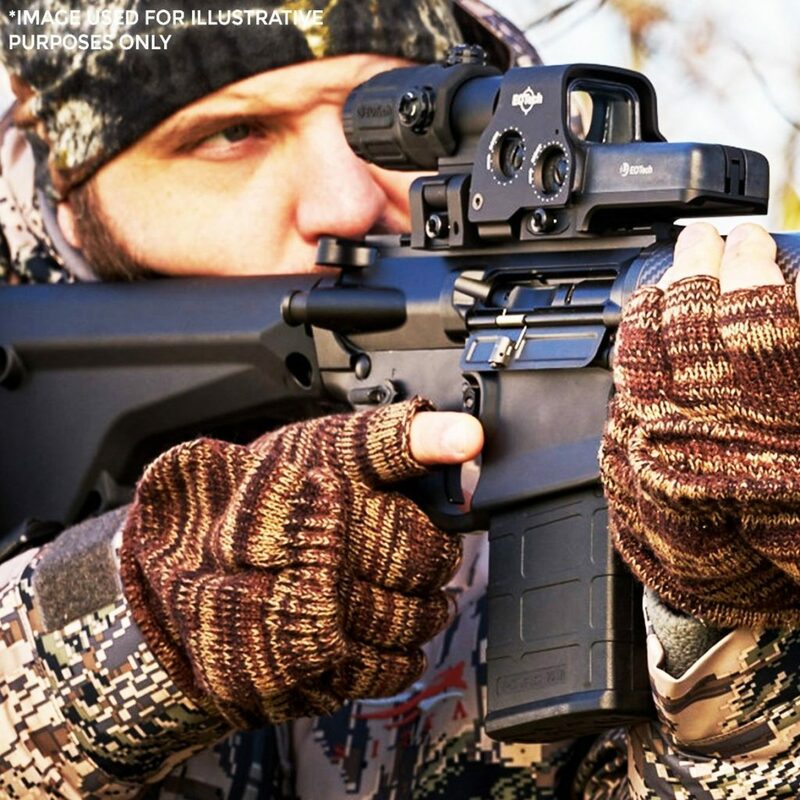 The Primary Arms FFP has become quite popular, especially among new shooters. It’s easily one of the most well regarded foreign made optics. Primary Arms also offers an outstanding warranty and great customer service. The guys over at The Truth About Guns did a pretty outstanding review on the Primary Arms FFP, and have updated it over a two year period. Choosing an optic is always a little tricky, especially when choosing affordable optics. You just need to remember to identify your needs first and determine if an affordable optic can fill that role. Sometimes it won’t be possible, but unless you need a weapon for duty use, its likely quite possible. Just remember, check the warranty, check what reputable sources say about the optics, and of course what other buyers have said. It’s often easy to separate cheap from affordable, and if you can manage that you’ll get rid of the optics blues before you know it. How did we do on the list? If you’re looking for our complete set of optics recommendations…check out our Reviews Section. What do you think of Sightmark,such as the 20× magnification and up? I’ve never used a Sightmark, I haven’t heard great things though. For 1k shooting, I would go with a Vortex Diamondback Tactical 4-16x or the 6-24x. You can get them for $290-350 fairly commonly. What would you suggest for a 6.5 creedmoor. Depends on what you want to do with it, personally, I’m using a Vortex Diamondback Tactical MOA/MOA 4-16x and I LOVE it.